"California – Union Square, San Francisco"
Union Square, San Francisco - Site of Admiral George Dewey Monument, commemorating the victory of Manila Bay, Spanish-American War. 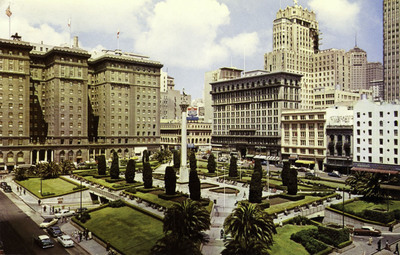 In this picture are Hotels St. Francis, Sir Francis Drake and Plaza, also the underground garage. One color postcard with a divided back. The postcard was published by Mike Roberts Stutudio in Berkeley, California and printed by E.F. Clements in San Francisco, California.